The happy couple’s main goal was to throw a great party with fun activities for friends and family. Their romance began in an elevator. Jimmy immediately interrogated his brother about his neighbor — then Kristen Valente — and a group dinner was arranged at Legal Harborside a few days later. They’d like to say that the rest is history, but things weren’t that simple. Jimmy, a hockey player from Dorchester who competed for Boston College before going pro, would soon be joining the Florida Panthers for the 2014-15 season. (Jimmy is currently under contract to the Pittsburgh Penguins; Kevin plays for the New York Rangers.) They hit it off, but Kristen was a tad skeptical that anything would come of it. They Skyped and saw each other when they could until Jimmy returned at the end of the season and they were able to spend more time together. That July, he signed with the Bruins, and they moved in together that fall. He popped the question on a cold day in March 2016. They had discussed a summer engagement. However, once Jimmy picked up the cushion-cut diamond ring from a Toronto jeweler during a trip to play the Maple Leafs, he couldn’t wait. As soon as he returned to Boston, he asked Kristen’s dad to meet him that night for dinner. “Apparently Jimmy was so nervous it took him half an hour to bring it up,” Kristen says. Jimmy Hayes surprised his now wife, Kristen, when he proposed. “I didn’t expect any of it, since it was the middle of hockey season,” says Kristen. Their number one priority was to throw a great party with fun activities for friends and family. The weekend kicked off with an early rehearsal dinner at the Ocean House Restaurant in Dennis Port, followed by welcome drinks with everyone at The Port Restaurant & Bar in Harwich Port. “The girls stayed out late with the groomsmen that night, but they showed up right on time the next morning,” Kristen says. Jimmy and his groomsmen — his brother and best man, Kevin, six BC teammates, and Kristen’s two brothers — had an early tee time, then chilled with beers and snacks at a nearby rental. The women sipped champagne in a suite at the Wychmere, dressed in floral Plum Pretty Sugar pajama shorts, a gift from Kristen. The Wychmere Beach Club in Harwich Port. The bridesmaids — six girlfriends and Jimmy’s three sisters — wore neutral gowns in soft silhouettes by Joanna August. Justine Johnson of Flowers by Justine, who also designed the arrangements for the reception, created bouquets of generous white blooms with hints of blush, plus silvery greens for texture. A white trolley transported the bridal party and the couple’s parents to the Wychmere. 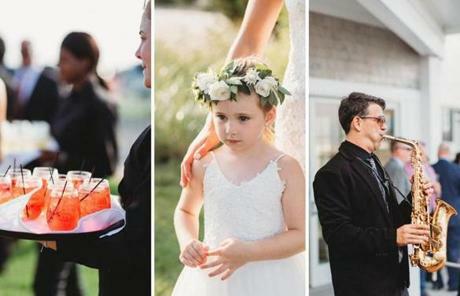 There, 285 guests enjoyed raw oysters and jumbo shrimp, mini lobster rolls, “haute” dogs on miniature brioche buns, flatbreads, and other hors d’oeuvres, along with Cape Codders — Kristen’s dad’s favorite cocktail — on the brick patio. From left: Cape Codders make the rounds at the reception; Neila Rose, Jimmy’s niece, serves as flower girl for her uncle and new aunt; and a jazz trio plays during the cocktail hour. 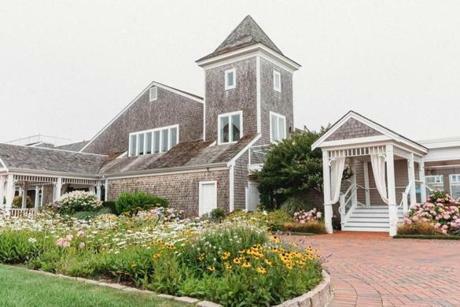 A traditional dinner of grilled filet mignon or crab-crusted local cod was served in an airy space with wood beams and driftwood floors overlooking the harbor. The bridal party sat at a long white farm table draped with a eucalyptus garland. Casually elegant arrangements of lush peonies, ranunculus, and garden roses, plus lots of white candles, added to the romance of the room. The catering team created custom individual crème brûlées, Jimmy’s favorite, for dessert. 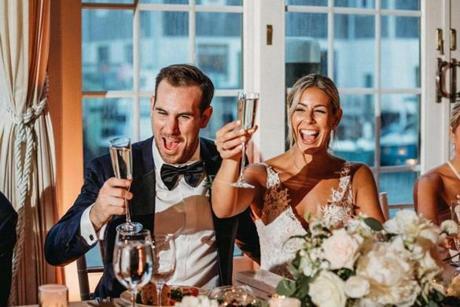 Newlyweds Jimmy and Kristen Hayes lift their glasses for a toast during their wedding reception last July.